You are here: Home >> Art ideas >> 20 Winter Art Ideas For Kids that are Frame-worthy! Capture the beauty of the season with these 20 Winter Art Ideas for Kids that are truly frame-worthy! From penguins to snowmen to landscapes – everything can be turned into art! They say that every season has its own beauty, but my favorites are spring and winter. Although it doesn’t snow here, the chill in the air reminds me that it is snowing somewhere in the world! And then I imagine snowflakes, snowmen and beautiful winter landscapes. One great way to put that imagination to good use is through art! Get the kids and your supplies together and create some breathtaking winter art that is truly gorgeous. Trust me, even kids can create frame-worthy art without much time or trouble! Let’s start off this list with a happy project, shall we? And we can’t think of anything happier than these smiley colorful penguins from Deep Space Sparkle!! A combination of collage and art techniques, it’s a fun project for even young kids. 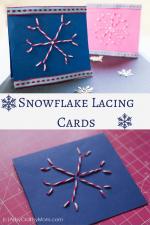 Snowflakes are an integral part of winter and we’ve been having fun with a Popsicle stick snowflake craft and a snowflake lacing card. But you should definitely give this cool snowflake art project from Art Projects for Kids, which uses salt to create some lovely textures. The night sky is always a beautiful sight, but it’s particularly gorgeous when it’s winter and snowing! Buggy and Buddy have the perfect art project to reflect a winter night sky. All you really need for this are paints in basic colors and a brush! You know what’s more fun than watching snow falling through the night sky? Catching them on your tongue! Runde’s Room has recreated this in an adorable art project that represents a kid looking up with mouth wide open – and catching a snowflake on her tongue! Here is the perfect winter art project for your preschooler – a cardboard snow globe! Crafty Morning shows us how you can create a cute little snow globe craft and develop your child’s motor skills at the same time! Just basic craft supplies, and you’re done! Want to create art that looks like it was painted by a famous artist? 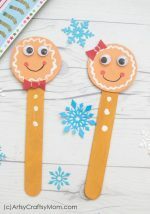 Well then, this project from The Pinterested Parent is perfect for you! Check out the video which shows you the genius method of using a fold and print method to create beautiful winter reflections. When you think about it, snowmen are kind of easy to draw. You justeed a few circles on top of each other then a carrot nose and eyes. But how does the same snowman look from ana aerial view? Tiny Art Room has th an art project about perspective that’s really interesting! We love trying out different techniques of painting, which is why we love this particular project from Hello Wonderful so much! The background has a cool blizzard look because of salt, and the squeegee creates some really pretty winter trees! No, we aren’t going to be painting mittens – we are talking about a cute and colorful art project from Klassen Klunst. The mittens are basically a tissue paper collage while the actual art happens in the background. But the end result is just so eye-catching! 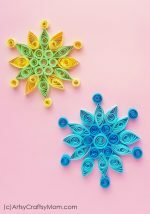 Watercolors and oil pastels join hands to create stunning snowflake art, as shown in Arty Crafty Kids. The end result looks like it took a long time to do, but the basic process is pretty simple. As kids continue painting, they’ll be amazed at how their snowflake just pops! We’ve all heard of Robert Frost’s lines, ‘The woods are lovely, dark and deep’, and this art work from The Crafty Crow perfectly captures the essence of these lines. This frameworthy piece of art makes use of an eye dropper, a toothpick, tape and of course, a paintbrush! There are so many ways you can do this delightful aspen tree and birds project from I Heart Crafty Things! Make the birds a solid color or a mix of colors. Paint on the beak or stick them. Draw eyes or stick googly eyes. The options are endless, making it great for all age groups! If your little one has just learned the names of shapes, she’s sure to be excited to try out this shape art from The Pinterested Parent! Basic shapes come together to create a village, but it is the details that makes it so interesting. 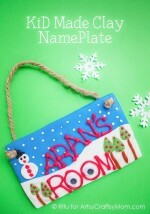 Use buttons, cotton wool or anything you want to make your village come to life! It’s amazing to see the art effects you can create with just a Q tip! 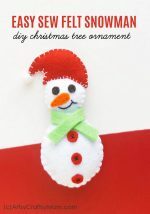 Easy Peasy and Fun shows us how to use this humble object to create a lovely snowy effect on nothing but a black tree on a blue background. For younger kids, you can do the tree first and let them do their stuff with the Q tip. Alright, this is one art project you might want to take outside, even if it’s cold! The kids are just going to love this process art from Play to Learn Preschool – it involves a lot of ‘getting your hands dirty’! But they are going to be even more excited after the final reveal of the bear! The Northern Lights, also known as Aurora Borealis, are a light display phenomenon, usually seen in places like Alaska, Greenland, Iceland etc. The sight is too magnificent to put into words, but That Artist Woman has tried to put it into a picture! Check out this amazing art project that deserves a golden frame! We’ve looked at how winter appears in the woods, now let’s take a trip into the city! Painted Paper Art has a simple but effective technique to recreate a city in winter. The painting of the sky and cutting out of the buildings is a good idea, but it is the addition of glitter that truly makes it frameworthy! Recycled projects are always extra interesting, and this one from I Heart Crafty Things makes use of two things – bubble wrap and newspaper! It’s fun to paint with unusual things like bubble wrap, and it creates a wonderful snowy effect on the background. Painted Paper Art brings Alpine Trees to life in a beautiful winter art project. The use of different shades of green for the trees is a great idea and really makes the trees more real. The use of pre-painted paper for the ground is also genius! Just looking at this picture makes you feel all festive doesn’t it? Elementary Art Fun gives us an art project that has a good mix of colors and a realistic look – just look at all those branches criss crossing each other! 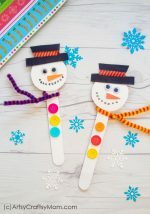 Aren’t these winter art ideas for kids just gorgeous! They’re pretty easy to make too, and many include a mix of different art techniques. It’s great practice for the kids and will encourage them to try more challenging projects. So tell us, which work of art are you framing this winter?